The Drakensberg stands like a formidable rocky barrier between the lush green foothills of Kwazulu-Natal and the mountainous kingdom of Lesotho. It has inspired poets and exhilarated climbers for the last two centuries. The indigenous population of San, followed by Zulu and Sotho peoples have made homes and sacred sites of the red-hued sandstone cliffs. The Zulu have given the appropriate name of uKhahlamba, ‘Barrier of Spears’, to this incredible basalt range. Nowadays the ‘Dragon’s Mountain’ inspires photographers! Join Nature’s Light to photograph the craggy spires as wet clouds drift from peak to peak. 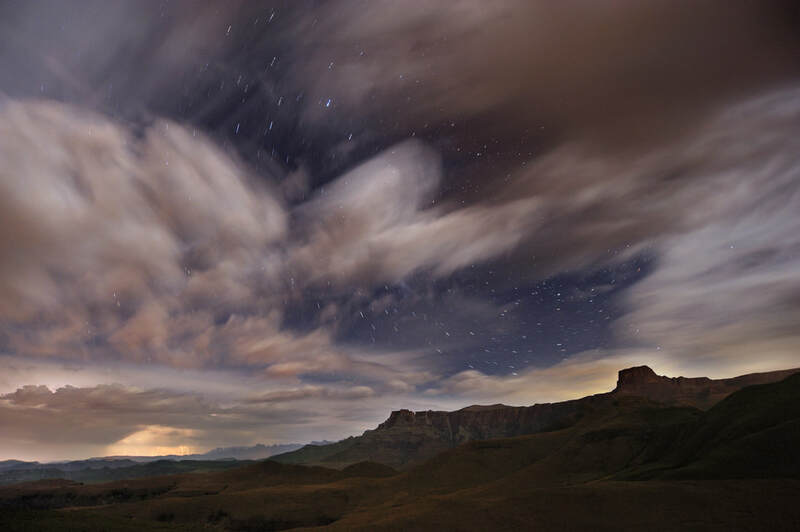 Learn to photograph the stars as they spin over the Berg Escarpment and its sentinels of rock. Become enchanted with the magical streams of water that perpetually gush from the mountainside. We select only two primary locations for this mountain masterclass so that there is a minimum of travel and a maximum of shooting time. 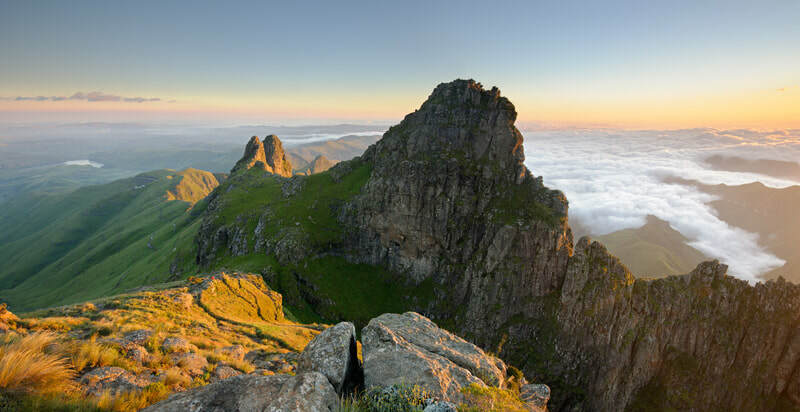 We also opt for two very diverse locations in terms of the geology of the mountains; so photographers get to experience the heights of the Drakensberg as well as the valleys and their enchanting forests. Please note that this tour is not a traditional relaxing holiday! It is a serious photographic workshop with teaching sessions/lectures at locations, and photography guidance in the field. It is for those photographers/photography enthusiasts who want to take their photography to the next level, with a steep learning curve, visiting iconic destinations with a tutor on hand to help create masterful images. The emphasis is very strongly on landscape photography, and teaching sessions covering both creative, technical and editing aspects. Participants can choose which topics they would like to cover during the workshop. In doing so, teaching requirements can be assessed during the workshop and tailor made to suit individuals needs. Therefore, this workshop is suitable for both beginners and experienced photographers. When required the group can be split so that the two instructors can each teach different topics or for different abilities. As an added bonus at the end of the workshop we print each photographers favourite image as an A3+ Fine Art inkjet print on an Epson fine art printer (on occasions when we can’t transport the printer we courier the image back to the photographers). The Amphitheatre - one of South Africa’s most iconic mountain faces. 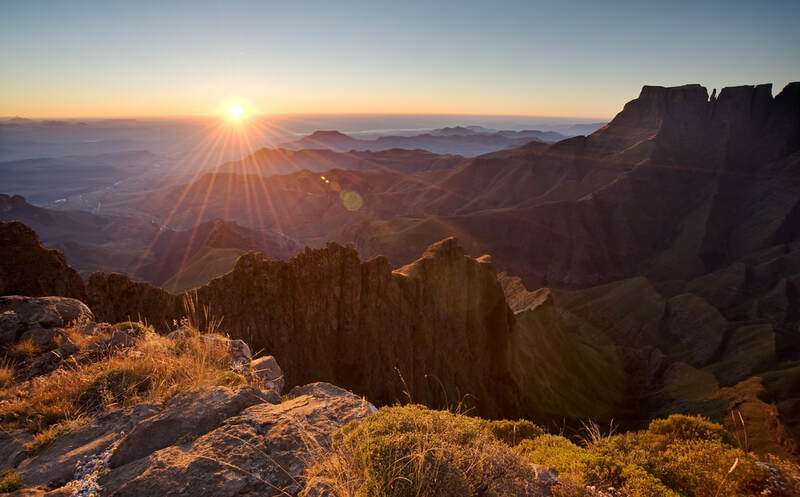 See the sun rise from 2400m above sea-level and half way up the Drakensberg. Explore the Tunnel and its exquisite sandstone curves. 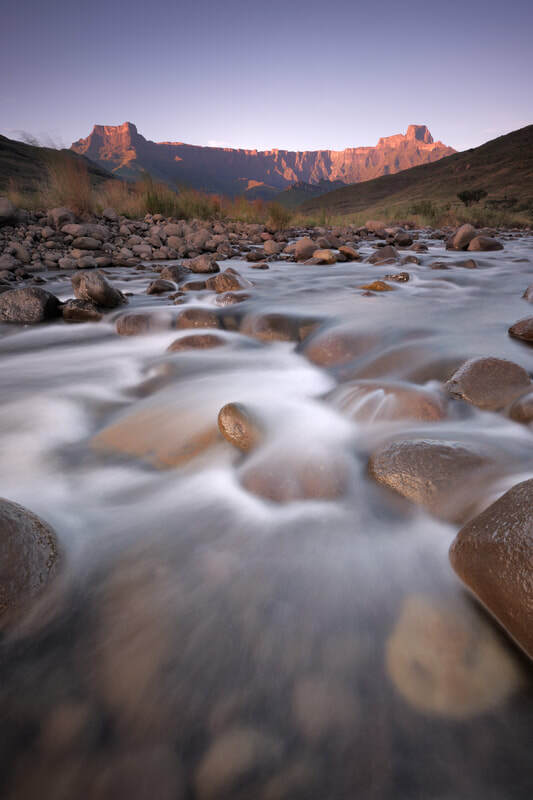 Capture one of the most iconic views of the Drakensberg, seemingly only ‘discovered’ by experienced photographers. Probably the world’s best instructor to participant ratio, maximizing your learning while on tour. 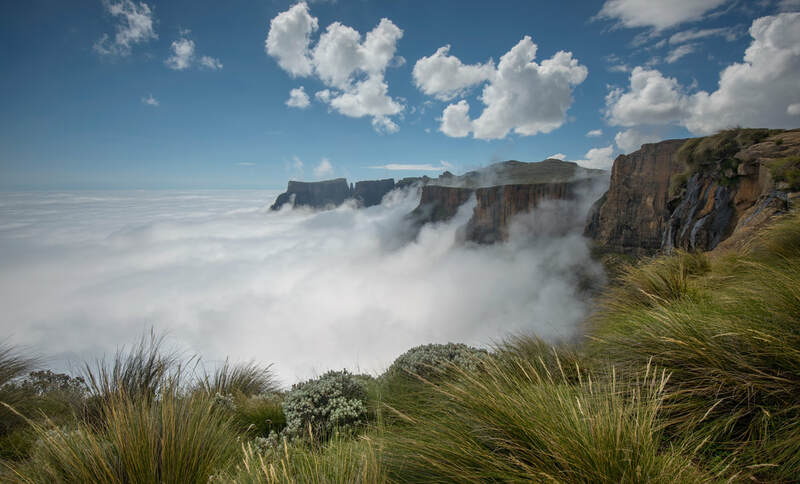 Having highly experienced tutors watching over your shoulders and helping you on the spot as you craft your images of the amazing Drakensberg with its beautiful valleys and peaks. Spending time with like minded people in one of South Africa’s most spectacular places. Creative Composition: The basics and beyond, such as The Element Approach, Balancing Composition etc. Basics to advanced techniques in digital landscape photography. With two instructors (depending on group size) all levels of ability can be catered for. Workflow & digital asset management. How to create awe-inspiring Astrophotography and star trail images. How to create time lapses (optional). Post-production using Lightroom and Photo Shop. Emil regularly runs workshops and classes on Lightroom, Photoshop layers and masking and luminosity masking. These sessions will be included in the travel itinerary for those who want to spend more time on these aspects. Whether photographers decide to travel on their own or join Nature’s Light in traveling, we all arrive just after lunch at Thendele in the Royal Natal Section of the uKhahlamba Drakensberg National Park (detailed travel directions given to participants opting to travel in their own vehicles). Nature’s Light can provide transport from King Shaka International Airport in Durban. After a short rest and introduction to the workshop the group leaves for a shoot. After the days to the Cascades to photograph waterfalls and flowing streams. From there we make our way to a restaurant for some of the best pizza in the country. An early morning start sees us on the boulder-strewn Tugela River with the awesome Amphitheatre as our backdrop. There is very little in the way of walking, so the day is a restful one in this regard. After breakfast we spend some time looking at Photoshop and the processing of star trails before leaving for Witsieshoek. On the journey to Witsieshoek we stop at several locations for landscape composition exercises and a shoot amongst the sandstone boulders of Retiefsklip. After our arrival at Witsieshoek and a short rest we reconvene for a seminar and critique session on the images that were processed in the morning. Day 4 starts with a very early departure for Sentinel car park. Our goal on this morning is to reach the Witches Viewpoint, half way up the path to the Chain Ladder. 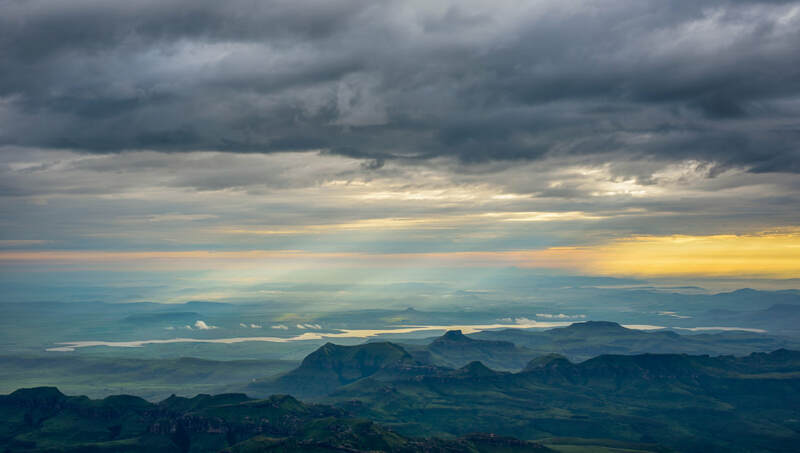 This phenomenal viewpoint affords one of the most spectacular sunrise points in the Drakensberg. 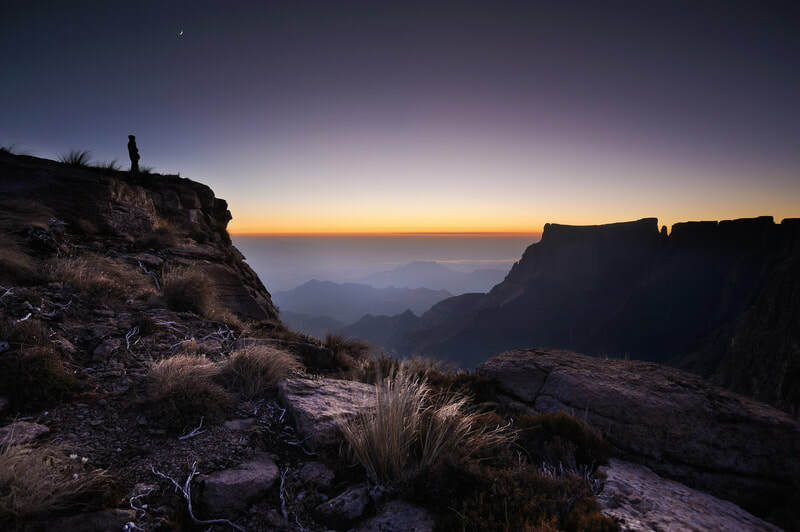 It is a fairly strenuous walk, especially as most of it is done in the dark (head torches are compulsory), but the view itself has meant that, to date, it has been the highlight for most of our photographer guests. We return shortly after sunrise to have a full breakfast at Witsieshoek. Seminars, guided editing and a critique session follow breakfast. In the late afternoon we once more head out for a shoot before dinner. After dinner we do another star-shoot (preferably with glass of wine in hand ;-) ). A final optional dawn shoot is the perfect way to begin our final day in the mountains. We are able to watch the sun slide up the mountains from the edge of the ‘Little Berg’ as it looks down over Royal Natal and the Tugela River. After breakfast, photographers get the opportunity to print their favourite image that they have created as an A3+ fine art print on a dedicated Epson large format printer that we bring expressly for this purpose. We depart around 10 or 11 in the morning, either traveling back together to Durban (King Shaka airport or accommodation in the area) or separately. This is an annual workshop. The 2019 edition will run from the 10th till the 14th of February 2019. R14 930 per person (approximately USD 1,030 / EUR 895,00 as of October 2018 Exchange rates). Minimum 3 participants, maximum 6 participants. We indeed feel the tour is very competitively priced. 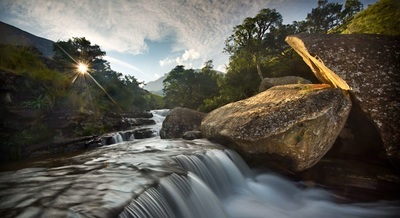 Just Google “South African Photographic Workshop” and see what prices you get, and what you get for those prices. Cheaper options are few, and they invariably use cheap accommodation that may not be the best location for your photo shoot, or exclude transport for example. We are confident in our best value for money approach, where we don’t cut on quality and offer a pretty much all-inclusive tour at a fair price. Given that the tour leaders are South Africans and that South African salaries and taxes are considerably lower than their European counterparts, we are able to pass this saving on as a rather more competitive price.